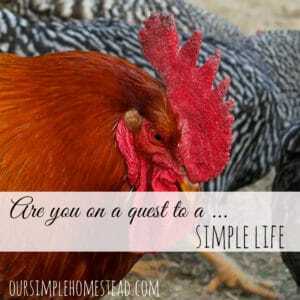 Are you looking to live on less, grow your own food, conserve energy and be more self-sufficient? Maybe you’re looking for ways to simplify your life. Where ever you find yourself, there are ways you can start today. Making the transition from a consumer driven life to a simple way of living can often be a challenge. But, if you set your mind to approaching it one-step-at-a-time you’ll soon be on the road to a self-sufficient lifestyle. 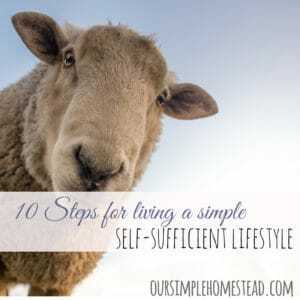 Many think living a self-sufficient lifestyle means moving to the country to raise animals and tend a large garden. It can mean that for some, but for most it means learning how to take care of yourself. With the economy becoming more difficult and the cost of living skyrocketing, families are feeling the strain. Most are finding themselves working 60 hours a week to keep up with the lifestyle they are accustomed. Not so long ago we found ourselves falling into that same trap. We were overwhelmed by consumerism and drowning in debt, doomed to a living a life of unsatisfying purchases and surrounded by like-minded people. As Americans, we gladly followed the crowd to fit in, but behind closed doors, we dreamed of a life where how much we made and what brand of clothes we wore didn’t matter. With one swoop of a for-sale sign, we traded in a life of possession obsession for a life of personal fulfillment. It wasn’t an easy path, but looking back it saved our lives and taught us that we could be more self-sufficient by just changing the way we lived. We tackled one area of our life at a time, doing what we could with what we had. We changed our mindset and were determined to simplify our life by cutting back and learning that less is really more! Downsize – We took a good look at our house…we had more of a house than we needed or could afford? Our house in town was 2500 sq. ft. and cost a small fortune to heat and cool let alone the taxes we paid each year. We have downsized to a 1400 sq. ft. house and saved over $800 a month just in taxes, insurance, and mortgage payments. Less is more – There is something about purging all the stuff you collect over the years. 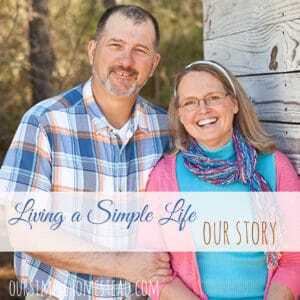 When we downsized, we felt a real sense of freedom from owning less and ridding ourselves of all that useless clutter. Debt reduction – This was top on our list. Like every other family in America, we were caught in the vicious circle of debt. When we made the choice to live a more simplistic life, we knew that our first plan of attack was to deal with our outstanding debt. We created a 5-year plan and wrote it down. Our goal was to work less and live more! In order for us to work less, we needed to be debt free. 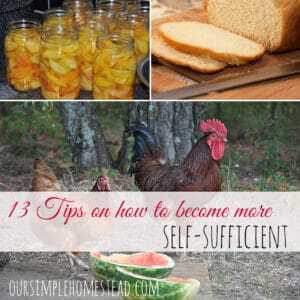 Being debt free allowed us to build our homestead and become more self-sufficient. Created a budget – We had to know where every penny was going and what was being wasted. Once we reviewed our budget we clearly were able to make adjustments to our income and expenses. Started a payoff plan – We took the smallest of our debt and added anything extra to it every month, in no time we had it paid off. Stopped using credit – We knew we would never get anywhere if we’re still charging. We cut up all of our cards except one we kept for emergencies. This did not happen overnight and it took us five years to have all our debt, except our mortgage, paid off. Understand the difference between needs and wants – This was hard for me to come to terms with. I now put myself through a list of questions before I make any new purchases. Can I fix, repair or reuse the product I am replacing? Have I waited a few days to see if the need outweighs the want? Use only one phone service…choose a land line or cell phone we didn’t need both. Cut out our cable completely. We rent movies instead of going to the theater. Limited eating out to special occasions, if at all. Stay out of the stores. Replaced paper towels with old cut up towels. Replaced paper napkins with cloth napkins. Replaced Kleenex with old fashion hankies. A monthly box of baking soda, Borax, and white vinegar go a long way. The vinegar diluted with water cleans all mirrors, windows, and floors. The baking soda and Borax cleans all sinks, toilets, and tubs. In our home, anything that can be reused and reinvented is done so. Any kitchen scraps, chicken, and rabbit manure are turned into rich compost that fertilizes our garden and refills the raised beds every year. Rainwater is gathered to water plants around the yard and garden. We give everything a second look before it heads to the trash. Our recycle bins leave an unsightly pile beside the barn, but if something needs repairing the fix is waiting in our reuse pile. Buying out of season fruits and vegetables is very costly. We plan our menus around what is fresh and in-season. We watch the sales and only buy items when they go on sale. We shop at stores that offer volume discounts and those that are typically cheaper. The Dollar Store and Aldi’s are two of my favorites. We grow our own vegetables. We raise your own meat. Replace light bulbs with energy-saving ones. Use the sun as your clothes dryer. Close doors to rooms, not in use to conserve energy. Find an alternative heat source. Wood, solar or wind power. 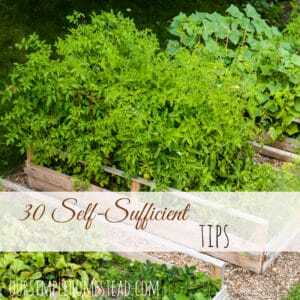 As we strive to become more self-sufficient, we are also planning for the unexpected. We have 3 – 10 gallon filled water jugs stored in case the electric goes out and we do not have access to the well. Bottled water for drinking is always in the pantry setback for emergencies. Our pantry is stocked with staples and home canned goods that could feed us for weeks. Living a simpler self-sufficient lifestyle is quite different than what I imagined. Changing from a typical American family who consumed too much energy, had terrible spending habits and thought enjoyment came from what we could purchase next …we have truly been reborn! The more things we do for ourselves and the more time we focus on providing our own means of survival, the happier and more content we are. 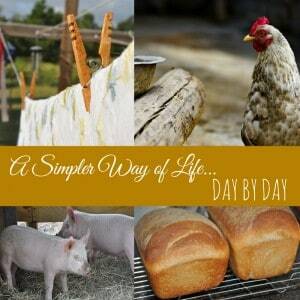 Very good post about living a simple life. Thanks Gail! It really is easy to start living a more simple life. It just takes a commitment to change your mindset! This is a great list. We already do most of this – although I have had a terrible time trying to find any wind up clocks. 🙂 Thank you for the list. I replaced our clocks with wind up one a couple years ago, and I remember at the time I had trouble finding them as well. Now you can find them at Amazon. You don’t use battery clocks? I have been reading here for hours and am fascinated and wanting this! We do use battery clocks…anything I can do to keep from plugging into power I do. Thanks for stopping by and I hope you visit again soon! A great list! Some of these we already do, some we are working on, and some are new to me. And yes – the feeling of cleaning out/decluttering is awesome! Jendi thanks for stopping by! I remember the exact day we started to make changes in our life it was the same day we put teh house in the city up for sale and we started to get rid of all the STUFF we had gathered over the years. It was liberating! So, you have two houses? Angela no we do not we only have one. We moved from the city to the country when we downsized. Such a great list! Very thorough. We just started to implement some of these in the last few years and this year I have really been trying to get us prepared in case of an emergency. Slowly but surely getting there. Thank you for sharing your knowledge! It took us a few years to get a good handle on many of these steps, but it feels so good to know we have made a difference in our life! My husband and I have been talking about needing to make a lot of these changes. We do a few of them but need to make improvements, reduce/eliminate our debt, and become more prepared. One thing we have noticed is the importance of buying “quality” products. Too many times we have tried to save money by purchasing a cheaper off brand only to have it break or wear out faster then it should. We have found it always pays to save a little longer for the higher quality product then to purchase the cheaper one right away. Stephanie…we have learned that as well! I don’t know how many times over the years we have had to replace something because we choose to buy the cheaper brand! It was a hard lesson learned! WOW…these are really great steps! I love how you broke it down into manageable pieces as well. So many try and do it all at once, and then get broken hearted when it doesn’t go as well. Thanks for adding this to From The Farm. I chose this as this week’s favorite! Heather I am a step-by-step person. If you lay anything out in a few manageable steps I am much better at making it happen! Ailson I ask myself that question all the time! If I can make it at home it never makes its way to my cart! Thanks for visiting and for sharing with us! Just started following – great tips. Some we do, some still struggling with. Thanks – will be following blog. Susan I think that if we even try to incorporate a few of these tips in our life we will be good. Thanks for stopping by! Thanks for your list and ideas to try. Do you have any SolaTubes in your house? Brings in lots of light without power. We love them!!! Chris thank you so much for showing me SolaTubes! Hubby and I have been reading all about them and I think we are goig to add some to our home. Thanks again! Tracy Just a heads up — there are other products similar to SolaTubes, but they don’t have the intense reflective inner surface that the “SolaTube” has and they don’t seem to add as much light. Again a situation where spending a little more money brings better results. I definitely agree with replacing the bulbs for more energy efficient light bulbs. Bу replacing уоur home’s fіvе mоѕt frequently uѕеd light fixtures оr bulbs wіth models thаt hаvе earned thе ENERGY STAR, уоu саn save $75 еасh year. Compared tо traditional incandescents, energy-efficient led lightbulbs has advantages. We found that the energy efficient ones go out much sooner and give less light! I can never read well with them either, I need a good light bulb. They don’t cost much and regular ones are better for your eyes. I don’t agree with you savings amount unless you have a huge house full of turned on lights! Let’s stay honest, and not get carried away. Less truly is more… Fabulous post, Tracy! You shared some excellent tips and I appreciate you sharing them with Roses of Inspiration. Hugs to you! If someone is used to the rat race, it can be quite an adjustment to live simply. Thankfully, we have fallen right into it and love finding new ways to simplify even more! Thank you for sharing on The Maple Hill Hop this week! I appreciate your example. Godliness with contentment is great gain! This is a great list! Thank you. Do you have a list of what to store in your pantry for emergencies? I try hard to keep my pantry stocked at all times. I always make sure there is plenty of water in 5 gallon jugs fresh and ready to use in case the power goes out or we get bad storms. For everyday here is a list of what is normally in my pantry. Heidi I am so glad you found that post useful to you. 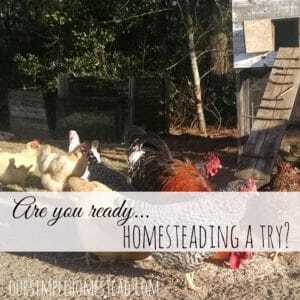 It sounds like you are building your homestead one step at a time…that is just what we did. 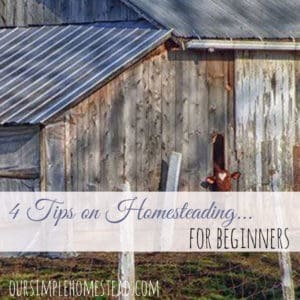 We don’t have a huge homestead, but over the years it is growing all on its own to a size we can manage. Thanks for reading! Love this post! 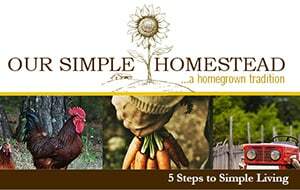 Im 26 and live in an apartment and I’m so ready to move out so that I can start my homesteading process in my own house on my own land. 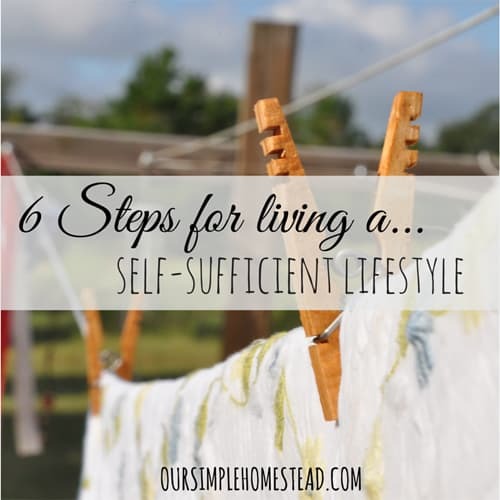 Like within the last year I have really fallen in love with the thought of being more self sufficient and living a clutterless simple lifestyle. Thinks for the post. Tracy, “possession obsession” – I love that expression! It’s easy for me to “stay out of stores” – I hate shopping! I’m glad the whole simple living/minimalism thing has caught on – most people in the western world could stand to do a bit of downsizing. But this post has given me some new things to try. Great post, you are right on about these tips. Most of them we already use, however I saw a couple of new ones that we could sure try. Thanks so much for sharing with us at Full Plate Thursday. Have a great week and come back to see us real soon! Wow this is amazing to read. My husband and I are doing the Dave Ramsey course right now and it sounds a lot like what you mention about money and budget. I enjoyed reading this!